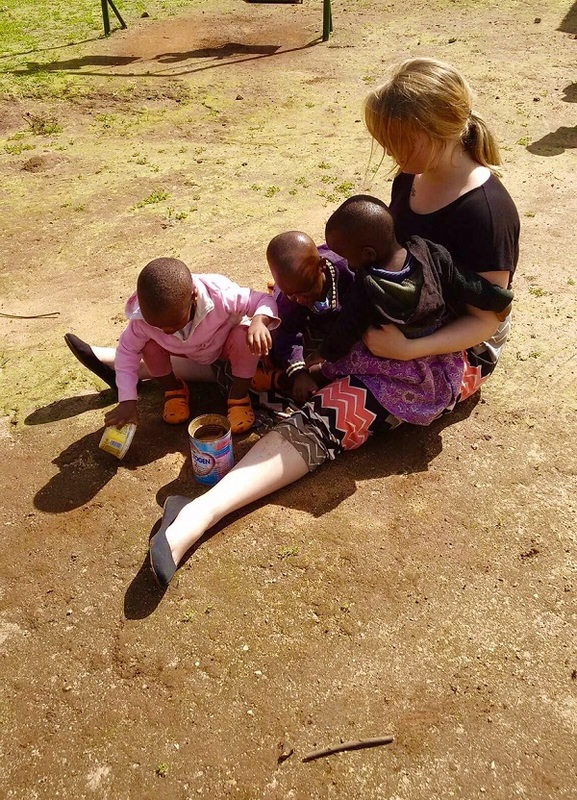 Two Social Work students from the University of Maine at Presque Isle gained the experience of a lifetime while completing their junior field work practicum at the Ushirika wa Neema Orphanage in Machame, Tanzania, Africa. Ushirka wa Neema means “Community of God’s Grace” and is part of the Lutheran Northern Diocese of Tanzania. Deaconesses called “Sisters” care for children from birth to age four. There are currently 29 children at the orphanage ranging from seven months to three and a half years. Many children live in the orphanage due to personal or health issues in their families or after losing both parents. Alyssa Summerson and Emily Nadeau are now senior Social Work majors at UMPI. While at Ushirika wa Neema, they played with and took care of the youngest children in the “baby house.” They were able to fill a vital need at the orphanage, as many of the adults were busy preparing meals, washing clothes and doing other housework, leaving little time to play with the children. UMPI Associate Professor of Social Work Shirley Rush arranged Summerson and Nadeau’s junior field work practicum through her connection with Sister Grace Saule, who works at Ushirika wa Neema. Saule is a member of the Mwika Musicians, a group of singers and musicians from Mwika, Tanzania who performed at UMPI in Fall 2015. Rush said that the orphanage is committed to giving all the children a nurturing environment. “The children are very well cared for at Ushirika wa Neema. They receive medical care and attention, adequate nutrition, shelter, and much love and care. They are bright, interactive, and beautiful and they meet their developmental milestones as you would expect any healthy child to achieve,” Rush said. As part of UMPI’s Bachelor of Social Work program, students are expected to complete 700 hours of supervised field placement to help people in need. The first 200 hours occur during a student’s junior year. Students are motivated to step outside of the classroom and relate the concepts and theories they’ve learned with experiences of working with people in different communities. Many find that travelling to another country such as Tanzania broadens their perspective and makes them think about how cultural differences affect the practice of social work. For more information about UMPI’s Social Work program, please contact Shirley Rush at (207) 768-9427 or shirley.rush@maine.edu.